Guardiola: "More in charge today"
Munich - FC Bayern Munich head coach Pep Guardiola said he was "satisfied" with the way his charges saw off Eintracht Frankfurt 1-0 in the second round of Bundesliga action, while Borussia Mönchengladbach boss Lucien Favre was similarly pleased with the way his Foals bounced back from their opening day defeat with a resounding victory against Hannover 96. 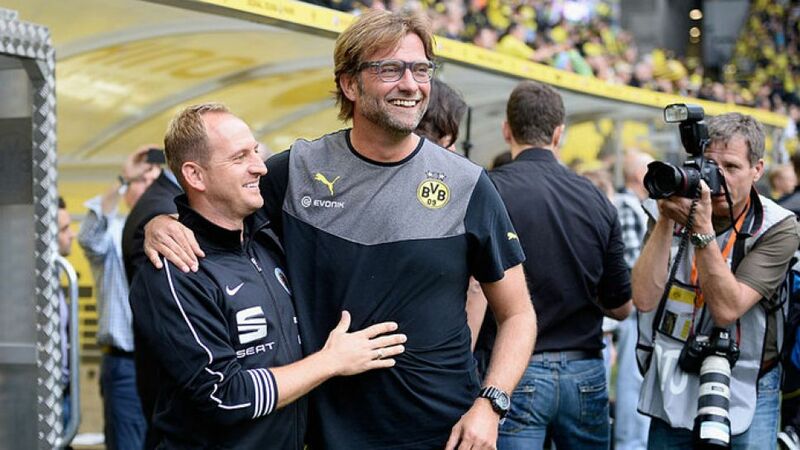 Jürgen Klopp (Borussia Dortmund): Braunschweig were very cautious and stuck to that match plan until the very end. But we were able to create a lot of chances in the second half and managed to turn the game in our favour when Jonas Hofmann came on. I'm satisfied with the result. Torsten Lieberknecht (Eintracht Braunschweig): I have mixed feelings about this game. We certainly proved a difficult opponent, but there were periods when we could've done better. Michael Wiesinger (1. FC Nürnberg): We were too passive after the break and we allowed Hertha to improve their game. After going down though, we responded very well and the team showed great passion. We can certainly build on this performance. Jos Luhukay (Hertha Berlin): For us it's two points dropped In the second half we were totally in charge of proceedings. Lucien Favre (Borussia Mönchengladbach): We were already under pressure after losing on Matchday 1, so winning was crucial. The way reacted was very, very good. Mirko Slomka (Hannover 96): Gladbach were very creative in attack today. We have to do much better in many respects, and I'm sure we can. Armin Veh (Eintracht Frankfurt): Our tactical approach was to allow Bayern most the possession, but they were very dominant and very much in charge after scoring the 1-0. But I kept believing our time would come if as long as we didn't concede again. Pep Guardiola (Bayern München): It's always difficult after an international break as most of the guys have only trained for two or three days with the rest of the group. I was satisfied with how well we controlled the game, though. Last week we allowed Gladbach to break forward on too many occasions; we were more in charge today. Dieter Hecking (VfL Wolfsburg): It was a perfect afternoon. We intended to mount lots of pressure on Schalke, and told ourselves at half-time to force them into even more errors. From the 50th minute on it became apparent how desperate my players were to win. I'm very happy with the way we managed to shake off last week's setback against Hannover. Jens Keller (Schalke 04): To lose by four goals without a doubt is a heavy defeat, even though I was satisfied with our performance in the first half, with our defending in particular. We also did well after the break when we created two good chances. After conceding though, we went to pieces almost, and that's why I'm not happy with our overall display at all. Thorsten Fink (Hamburger SV): We began well and made it 1-1 at a good time, but I didn't like that we fell apart again shortly afterwards. Our defending was very, very poor - we delivered a prime example of how not to defend. There's no use in us dressing the result up. We just have to look ahead and win back the fans. We won't alter our targets for the season. Markus Gisdol (1899 Hoffenheim): I'm very happy because my side's performance was solid, although we were a bit sloppy on a few occasions. Late in the second half we seemed to score from every attack, even though in the end the result might have flattered us a little. Robin Dutt (SV Werder Bremen): The team give their all in every match and that's why I think we deserved to win. Augsburg were brave and played well but we fought well against them. However, everyone here knows that we have difficult year ahead of us. Markus Weinzierl (FC Augsburg): There isn't much I can blame my team for. Unfortunately they didn't get the reward their efforts deserved. We had enough chances to level but it wasn't meant to be. Bruno Labbadia (VfB Stuttgart): We put in a lot of effort and a lot of what we did was really good, apart from the result, of course. We also gave our opponents too much space in the run-up to the own goal. Sami Hyypiä (Bayer 04 Leverkusen): I'm happy about the three points. Stuttgart made life difficult for us. We were poor in possession in the second half, but we put in a fighting performance. Christian Streich (SC Freiburg): I'm very satisfied because the boys did well again. We always try our best and we showed it today. There's a certain amount of pressure, but I knew this would come, and I've prepared myself for it. Thomas Tuchel (FSV Mainz 05): Winning away from home is always difficult, so now we're relieved and happy, of course. Two wins from two matches is more than you could wish for.